Beautiful, challenging, delicate and democratic, this secret art has inspired generations of artists, from Jean Dubuffet to Jean-Michel Basquiat. In this inaugural exhibition, the museum has invited leading international artists, curators and figures to explore the connection with contemporary art. Contributors include: Annette Messager, Eva Rothschild, Tal R, Jamie Shovlin, Bob & Roberta Smith, Richard Wentworth, Idris Khan, Arnulf Rainer, Ed Ruscha, Jockum Nordström, Klara Kristalova, Karin Mamma Andersson, Mark Titchner, Jarvis Cocker, Nick Cave and Anthony Hegarty amongst others. Each collaborator has chosen artists or artworks which influence or inspire them - including the spirit drawings of London-born medium Madge Gill, the recycled ceramic kingdom of Indian roads worker Nek Chand and the panoramic fairytale illustrations of renowned Chicago recluse, Henry Darger. 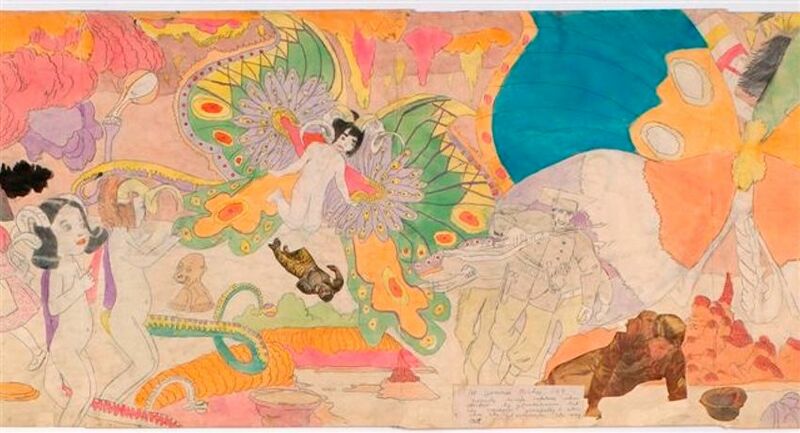 Darger is the most important marginal artist of the Twentieth Century - and this exhibition features a unique series of sequential images, displayed together for the very first time since his death in 1973. From janitors to jailbirds, mediums to miners, The Museum of Everything features over two hundred drawings, paintings, sculptures and installations, presented within a 10,000 sft former dairy and recording studio in Primrose Hill, just a few minutes from the Frieze Art Fair in Regents Park. The Museum of Everything opens with a gala VIP Frieze Affiliate event on 13th October 2009. The Museum officially opens to the general public on 14th October. Extendedhours and special events throughout Frieze week include a talk by Serpentine co-director Hans Ulrich Obrist, the premiere of the documentary MAKE by US filmmaker Scott Ogden and a screening of Jarvis Cocker's award- winning TV series, JOURNEYS INTO THE OUTSIDE.